Home DIY Projects	Spring Touches Inside! Well, it’s roughly 17 days until Spring officially arrives. And I’m ready!! My bulbs have started popping up and I fear for their survival with temperatures dipping down in the 30’s this week. To cheer myself up, I added a few spring touches inside! I always keep a large wrought iron urn on my kitchen island. It is one of my favorite purchases EVER. It is very heavy and substantial, which is another reason I keep it there. I can hardly move it! Depending on the season or holiday I like to switch out the contents. And because I don’t have a green thumb when it comes to indoor plants, they rarely last long inside. I try to buy plants that can easily be transplanted outside when they start looking puny. Last week I swung by the nursery and picked up a few things for my urn. I purchased a container of daisies which can be transplanted later. I also picked up a container of green shamrocks with white flowers and a pothos plant. I’ve learned that 3 of the 6 inch pots fits nicely in this urn. I line it with plastic bags to catch any water or dirt. Just pop them in and I have instant gratification! And my bunny (Her Royal Highness) stands guard. I have a favorite decorative gold leaf frame I like to use in my decor too. This frame is not quite a regular size frame so I need to trim the paper down just a bit to make it fit. The internet is packed with free printables. I like to find one and print out one that matches the season or holiday. I found this free printable on one of the beautiful blogs that I follow called Shabbyfufu. 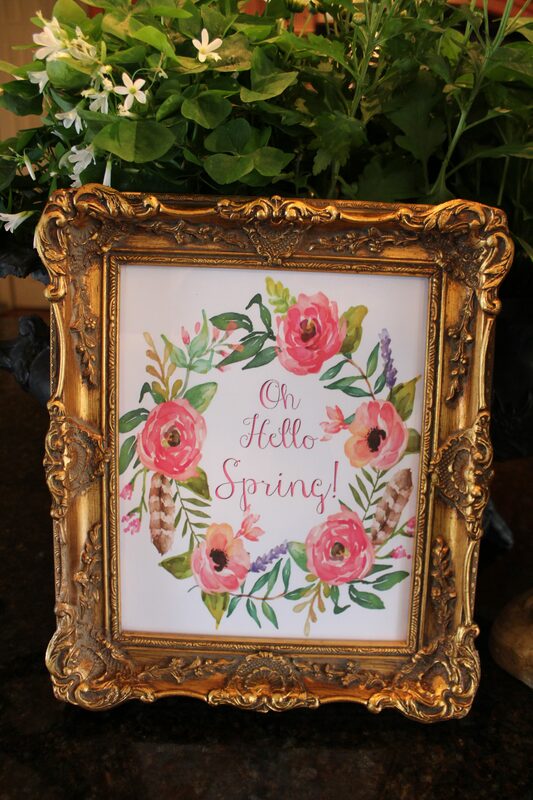 (You should check out her incredible blog and get this free printable at shabbyfufublog.com) This sign says, “Oh, Hello Spring” surrounded by a wreath of flowers. So pretty and colorful! I printed it out, trimmed it down and popped it in the frame. For now it’s sitting on my island along with HRH bunny and the urn. I still haven’t finished my rescued coffee table. I got side tracked running errands and getting ready for my younger son’s visit this weekend. (Yay!) And my grand-dog, Little Miss Delilah. You should see Lacey and Delilah playing together. It’s hilarious! Little D weighs only 7 pounds and Lacey is 70 pounds heavier. So cute.